3562 Evelyn Linton Classic-PG (Greed, Strippers) Evelyn and her husband owned a popular burlesque club in San Antonio Texas, which made them very wealthy. But no matter how many houses they owned, they felt empty inside. Then, an evangelist asked to preach at their clubs, and they realized what they were missing. "Unshackled!" 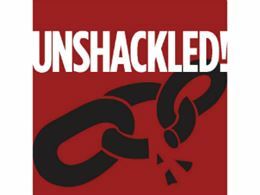 Ministry Resources Catalog To receive an E-Copy of the Ministry Resources Catalog email "Unshackled!" at [email protected] to make your request.